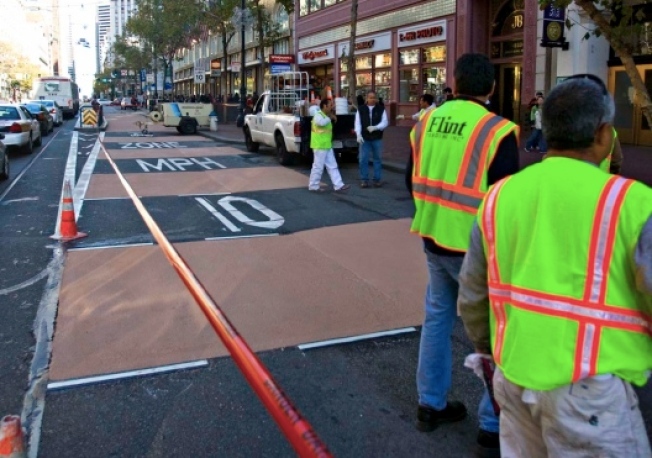 Sadly, the paint has lasted the trial on Market Street, but the trial continues -- now 25 percent more car-free. With more and more people cycling in San Francisco, a car-free plan for the mid-Market neighborhood got a new lease on life. Starting tomorrow, the mostly car-free Market Street trial will get another six weeks -- and a welcome new tweak. Traffic officers are currently stationed at 8th Street where they ask vehicles to take a right turn in the hopes of getting them to take Mission or Folsom Streets instead will be moving up to 10th Street. The Municipal Transportation Authority's decision should make it easier on cyclists, who won't be boxed in between a Muni bus stand on the left and cars making turns on the right, as they were when the forced right turn for cars happened at 8th and Market. The trial hasn't just benefited cyclists and pedestrians -- Muni running times from 10th to the Ferry Plaza have improved nearly a minute, with anecdotal reports from commuters suggesting their morning ride times have been reduced even more significantly. The beleaguered neighborhood also got a boost from Mayor Gavin Newsom, who dropped by an "artisan" hot dog restaurant in the area. Next time, maybe he could bike there? Jackson West doesn't think a little rain is any excuse not to cycle, but the number of cyclists riding by traffic counters probably would have been better if the trial was during drier months.